How to time-bomb a GPO? I am doing a lot of work in higher education where it is a rather common requirement to reconfigure a number of Windows domain members (e.g. PCs in a classroom) for the duration of a specific course or event and have this configuration undone afterwards. As most of the configuration changes we are requested to do can be done through Group Policy Objects and those changes automatically get reversed when the GPO is unlinked or deactivated at the OU level, this is a very comfortable route to take. The only downside is that repeated manual linking and un-linking of GPOs on OUs needs a lot of reminders and IT staff on duty before the courses start and after they end - something the operations team cannot guarantee at all times. Is there a way to specify a time frame for the validity of a specific GPO? This can be done by the means of WMI filtering. 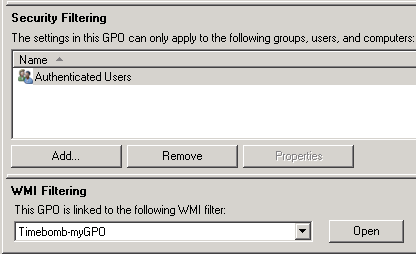 The group policy client would execute the WQL query from an attached WMI filter and only apply the GPO if the query would return a non-zero number of rows. 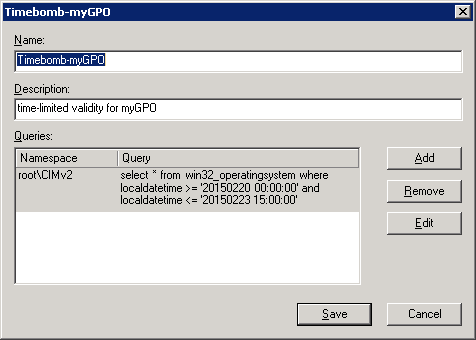 So by creating a WMI filter checking if the current system time is within a given time interval and linking this WMI filter to the GPO you want to timebomb you get exactly what you wanted. By default, computer Group Policy is updated in the background every 90 minutes, with a random offset of 0 to 30 minutes. So the default settings will only allow for a precision of +2 hours. The update interval can be changed by (another) group policy setting, if needed. Not the answer you're looking for? Browse other questions tagged active-directory group-policy or ask your own question. How do you override a GPO with another GPO? How to find which templates a GPO are using? How to bypass GPO loopback processing for some users?